As far as possible, every motorist would like to maintain his vehicle in showroom condition. Paint protection is important for your valuable vehicle as it protects it from minor dents, scratches, paint chips and debris when driving at high speeds, especially on long offroad trips. Protect the immaculate exteriors of your vehicle from scratches and stains by using the paint protection films in Dubai that are true market leaders, those from 3M. They come with self-healing technology that will make most minor scratches vanish without a trace. Yellowing, minor scratches and stains will no longer be an issue with these films that will be applied by our expert technicians. Scotchgard Hyper Shield is an essential protective layer designed to repel typical substances that can blemish or stain vehicles. On the car interior, it enables debris and spills from soft drinks, coffee, mud and slush to be easily wiped off both the seats and carpets. The product also helps reduce exposure to the sun’s UV rays, which cause upholstery discoloration and dashboard cracks. Meanwhile, on the car exterior, Scotchgard Hyper shield protects against blemishes from tree sap, rock chips, acid rain, and bird droppings. Moreover, this product guards both the inside and outside of the car for up to five years. All these benefits enable your customers to get top-dollar on a trade-in. Creates a chemical bond that gives paint surfaces a high level of protection from bird droppings, tree sap, bugs, etc. Helps safeguard the paint’s finish from premature fading and weathering. When this is applied to the fabric seats, spills settle on the top of the surface instead of being quickly absorbed. Your first line of defense in the fight for a clean and fresh car interior. Creates an invisible barrier against the detrimental effects of ultraviolet (UV) light. The non-greasy formula produces a rich satin sheen. If you are proud of your vehicle, don’t ever neglect your responsibility to protect it. Scotchgard™ Paint Protection Film (PPF) is a highly durable, high-grade, colorless urethane film applied to the high-impact areas of the vehicle—door edges, mirrors, bumper and hood—that bear the brunt of damaging road debris. What’s more, this invisible barrier against abrasion, flying road debris and weathering is also proven to effectively resist yellowing in sunlight. 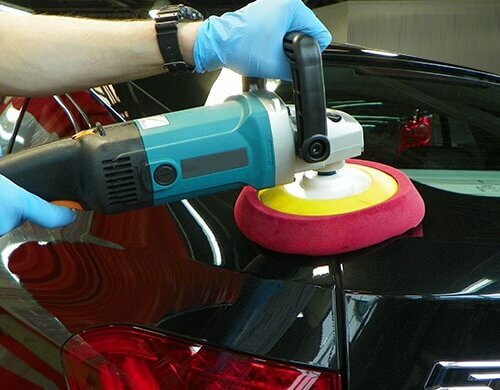 Given that resale value is important for any car owner, this is a fantastic way to help keep the car’s exterior looking brand new. Trusted by NASCAR® in keeping race cars looking their best, PPF’s quality is celebrated worldwide. Professional applicators offer recommendations on the parts of the vehicle that would greatly benefit from Scotchgard Paint Protection Film. They are also experts when it comes to installing the film to the exact specifications of your car. Once the job is done, you will see and feel the difference on the interior and exterior of your car. Plus, you will love the longer life added to your car’s finish. Give the 3M Scotchgard™ Paint Protection Film a try now! Our technicians have thousands of hours of experience under their belt. They painstakingly remove all contaminants and thoroughly clean your vehicle before applying the paint protection films. As the sealants used in the process are highly harmful chemicals and an inexpert paint protection job can result in swirls and scratches, it is crucial to have an experienced team handle the process. There are many brands of films in the market, but we use only 3M films to ensure that your vehicle gets the best available protection. A good paint protection job will definitely add value to your vehicle and should be at the top of your to do list when you buy a new vehicle. It will definitely play a crucial role in adding to the resale value of your vehicle. Give your vehicle the loving care it deserves with a paint protection job from Orange Auto. We provide many additional services like quick oil change, battery services and rim repair in Dubai. Our ceramic paint protection system comes with innovative technology to ensure that your vehicle paint remains free from any blemishes or fading over an extended period of time. Your vehicle will get a hard shiny transparent shell and a finish that makes it resistant to the effect of UV rays, impacts, sand abrasions, premature ageing, gravel sprays and bird droppings. Even acid rain will not be able to damage this coating. The ceramic paint protection coating has a highly hydrophobic or water repelling finish that repels water and makes the surface easy to clean. Due to this hydrophobic nature and nano ceramic technology, the surface to which this coating has been applied remains cleaner for a longer duration once it has been cleaned. Once it has been applied, the coating is permanent in nature and can be removed only by using machine polish. Another unique feature of this coating it that it can be applied in layers and the coating can be as thick or as thin as you want it based on your requirements. This protection system can be used for all painted surfaces and components like fiberglass, plastic trim surfaces, vehicle lights and wheel rims. 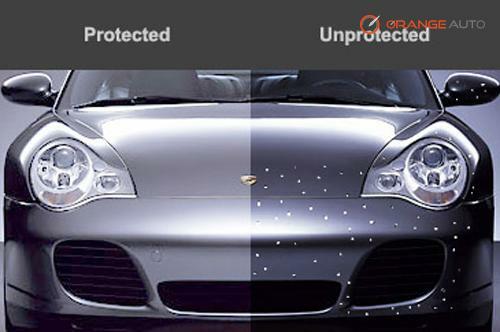 We are one of the few garages to offer ceramic paint protection in Dubai.